Have you ever wanted to log your private life in a way that’s not accessible to anyone but you? It’s not something you’ve just heard of. People have had this hobby of logging every day happenings and thoughts in their own diaries. As technology evolved, people started to share their thoughts with the world with the help of various blogging platforms. But there are still people who like to keep their private life private. There are ways to do that with all blogging platforms. You can protect any post’s visibility with a password, you can publish posts as private, or you can totally lock down your entire blog so it’s only viewable to the people you choose. However, I still find it irritating to log in to my blogging platform and write the stuff happened on any day. How much work do you need when writing diaries? Just open up the diary and write, right? I wanted something like that. Some of my readers may argue that I could use post via Email feature, but again, what if I forget to write something on any given day? Wouldn’t it be nice if someone would remind me every day to write my happenings? That’s exactly OhLife does. Using this sweet and simple little application, you can log your everyday life right from your inbox. It’s special because every day at your chosen time it sends you an email asking you how your day was. You just need to reply to that email and your day will be logged. In addition to that, you can attach up to one photo per day. Using this app, you can keep track of everything that happened on your life without disclosing it to anyone. It’s a time-saver, especially for those who always have a dedicated tab for their email (Gmail/Yahoo). At first, it sounds like yet another blogging platform. But trust me and use it for a week. You’ll eventually love it. I have been using it for over two months since I found it. Every day I reply to that email which arrives at 8pm. I don’t always write long list or description of what I’ve done or what I’ve been through. Sometimes, I finish it with a sentence or two. When I have something to share with people, I blog here. But for everyday stuff that people don’t need to know about, I prefer OhLife. It’s simple. It’s fast. It’s cool! Go on, give it a try! I’m sure eventually you’ll like it. Next How Do You Not Respond to Comments? This one is new to me, but I will look into it. Although, I do feel comfortable sharing most aspects of my life with the loyal followers I obtained on my own blog. Then again, there are aspects that I rather keep a secret, so this one could work out well. Not just for secret, you won’t find it interesting to keep your everyday happenings in a blog as interesting stuff doesn’t happen daily. In this way, OhLife plays a good role. You don’t need to do anything literally. You just respond to an email and your daily journal is logged. Anytime you have difficulty remembering what you were doing on a day, just check out your journal. Why do you want to write about every single day of your life? It keeps a log of what happened on a particular day. It’s helpful for me given that I always forget what happened on a particular day. Well, it just seem to me if something memorable happens, then that’s what you’d write down. But most of my days, especially work days, are pretty routine, so there’s literally nothing worth writing about that I’d feel the need to go back and read about someday. But I’ve kept a journal or diary or anything like that before. But I guess it may be a good idea for some, to get in the habit of just writing everyday, like the Post A Day 2011 thing last year. Yes, exactly that’s why blogs are here. I keep this blog to write down my thoughts and keep note of memorable days. However, my usual days do not need to be logged here in this blog. I will both lose readers and eventually get tired of it. 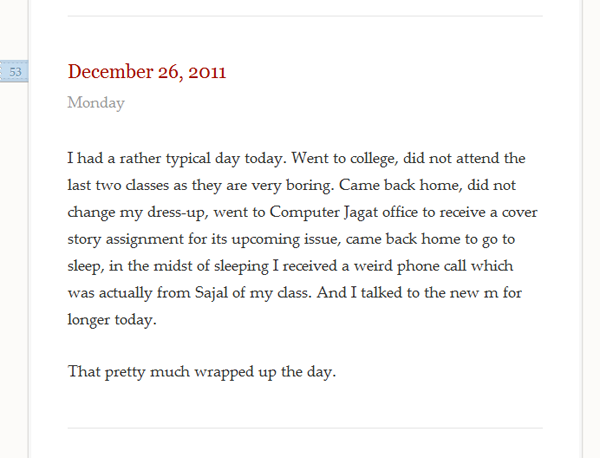 So, I don’t use any blog to keep every day journal, which you can guess will be cliched. It’s not like Post A Day or something. It’s just my regular day journal except the work for logging in, tagging my post, categorizing, writing and all those stuff. OhLife reminds me every day by sending a simple reminder to which I can reply with what happened on that day. Most of the time I end up writing two or three sentences per day. At the end of the month, I can check out what I did throughout the month or how my month has passed.